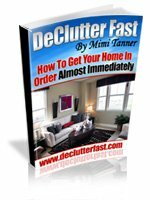 Get Rid Of Clutter - Home Organize It! Get rid of clutter on a frequent basis to prevent it from sneaking up and taking over your home. From pack rats to minimalists, families need to find a stuff-in-stuff-out routine to help keep clutter at bay. I've experienced "too much clutter" in my own home. And as a professional organizer whose worked with many families, I know it can happen to anyone. One family member may make it a habit to give away something when s/he buys a new item yet other family members may keep everything (or at least seem to). From pack rats to minimalists, when more than one person lives in a home, a balance needs to be worked out to help keep clutter issues from building. Clutter has become such a common state in people's homes that entire industries and professions have emerged to help people manage it. Professional organizers, home stagers and decluttering experts are just a few. Entire stores like the Container Store revolve around providing a myriad of organizational products, systems and containing solutions. Popular stores like Target include large selections of organizing products. Realty TV Shows like "Clean Sweep" and "While You Were Out" show organizational experts helping families get rid of clutter and take their life back - sometimes literally. Clutter can become completely overwhelming unless you are vigilant about addressing it and keeping your stuff reigned in. Below are some tips and strategies to help you get rid of clutter. I hope you find them helpful. Start with a small room like a bathroom. Pull everything out and sort it into the four boxes. Do any cleaning you want to do before putting things away. Take the keep box and put what's in it away in an organized fashion. Take the other three boxes an get rid of, donate or put in your garage sale pile. Then be sure to get the whole family on board to help you put things where they belong using the labels as guides. Add a decorative box or basket to the busier rooms in your home like the family room or kitchen. Use them as a place to gather items that don’t belong in that room. For example, if you find a pair of swim goggles in the family room they can go in the basket. Each night make it a routine to grab the basket or box and put the items away where they belong. You can even assign young children to do this as a chore. It's one of the most effective ways to keep rooms from collecting clutter because it's an ongoing kind of maintenance. When making a place for the items in your home, consider how often you use, look at it, etc. The only things that should be in sight are things you need or enjoy often (i.e., that special nicknack from a vacation). Primary use items should typically be kept within arm's reach. Secondary items can be in the same room but kept in cabinets, closets, baskets or drawers. Occasional use items are those you don’t need too often. Christmas decorations, special dinnerware and birthday party supplies are examples of occasional use items. You may need them on occasion but you don't need them cluttering up rooms for most of the year you are not using them. Here's another example, when you sit at a home office desk, your primary space is anything within an arm's reach. This is where you might keep a stapler, pens and sticky notes. In this case primary space might be on top of the desk or in a desk drawer. Secondary use items might include paperwork that you keep in a filing cabinet. Work on creating routines that will not only motivate you to get rid of clutter but help to keep it from overtaking any room or space in your home. Puting things away after you use them should be a number one routine. Encourage family members to do the same. When everything has a place and that place is easily recognizable then it’s easy to make sure clutter doesn’t accumulate. Clutter has become a huge problem in today's busy homes. Get rid of clutter first by using the four box method. Designate a box or basket to collect stuff in one room that belongs in another room and put the items away on an ongoing basis. Store highly used items within easy reach, less used items in top and bottom shelves of closets and cabinets, basements or crawl spaces. Label everything you can so everyone knows where to put things when they are done with them. Create family routines to keep clutter away. Avoid impulse buying. Get rid of things on a regular basis. Make sure that everyone in your home is on board with your clutter elimination plan. You'll enjoy the positive and freeing effects of a clutter-free home when you get rid of clutter and stay vigilant about it building up again. Return From Get Rid Of Clutter To Home Organize It!